The internet, in recent years, has become the biggest hub of consumer spending in the world. From cars to computers, it really is the most convenient place to do all of your shopping. This fact has not been missed by the world’s growing, ever-spending population. In fact, more money is spent through the internet every year. This leaves one distinct problem to face the web’s many vendors- “How do I get noticed?”. This issue , alongside the expanding internet economy , continues to grow each year. While getting lost amongst a sea of similar businesses is a plague which can easily infect even the most seasoned retailers, there is one common solution- the use of meta tags. Meta Tag analyzing is the constant occupation of many a competitive online vendor. In order to attract attention to your business without spending a fortune on advertising, you must be able to draw business from search engine traffic. Search engines, although at times picky, can be easily manipulated with the use of strategic Meta Tags. 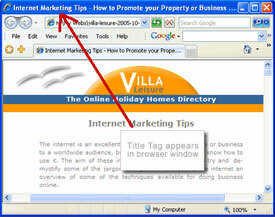 Meta Tags are placed in a site’s code, and tell the search engine when to bring the website up. For example, if you placed the meta tag “buy cars” in your web site’s code, the search engine would be more likely to bring up the site when the term “buy cars” is searched . This clever tool allows for smart proprietors to set themselves apart from the crowd. Meta tags, although a useful tool for making your site jump far above the competition, can be made even more effective when combined with other search engine optimization methods. Most search engines also thumb through the website’s body text, making judgments about when to bring up a site based on the text placed throughout your site. In order to make a site come up only under the right circumstances, you must take careful note of it’s Keyword Density. In order to draw the most relevant customers to your online store, you must fill up your site with phrases which are pertinent to the products or services which you offer. For example, if you sell gift baskets, be sure to mention “gift baskets” multiple times throughout your site, as opposed to adding irrelevant keywords such as “buy cars”. By tastefully combining the proper use of meta tags and keywords, you drastically increase the probability of bringing giddy customers to your site, but don’t go crazy. Different search engines have different methods of Meta Tag analyzing. Simply placing the same pertinent word or phrase on your site again and again will not make it come up in search engines. Using common-sense, take a moment to think about what content will best demonstrate what you do. Even choosing a catchy or relevant URL (web address) for your site can help you along the way. Use extensive content, and only splatter it with relevant keywords; as opposed to just typing “cars cars cars cars..” on your car site. Using these simple meta tag analyzing tips, you should be able to quickly and easily increase your search engine standing, and as a result start making more money. It doesn’t take a genius to optimize a website, but doing so can be a genius move. If you’re not sure how many time you’ve used a keyword throughout your web site, there are numerous sites which allow you to check keyword density. The density of any given keyword should not exceed 4% per page, or the text will lose some of it’s effectiveness. Now go out there and make your website visible to a whole world of customers!